Peter Irniq: Louis Alianakuluk Uttak, welcome! Louis Uttak: I feel very welcome, being here. Louis Uttak: It is wonderful that you have come. Louis Uttak: Yes, absolutely, no problem. 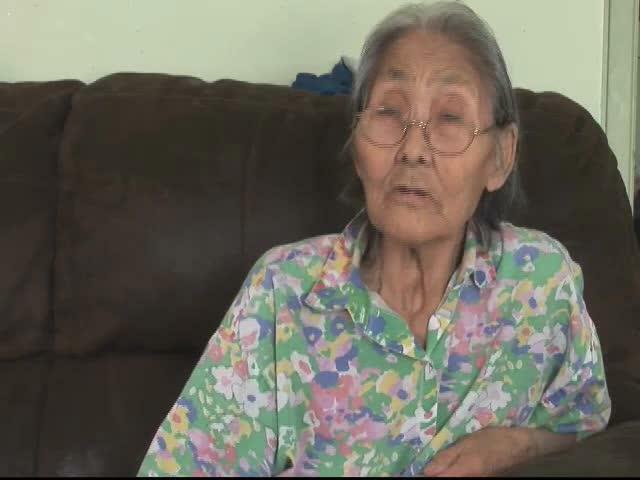 Peter Irniq: You are obviously aware and now of Inuit who were taken to a Residential School in Chesterfield Inlet, during the 1950’s and 60,s from Iglulik, and the survivors from here were the largest numbers, that went there to go to school. How did you feel as a relative when these children were being taken to school, I know for sure that you yourself, never went to that school? Louis Uttak: At that time, my father was a handy man at the Roman Catholic Church so we had very few people in the settlement. When the children were being sent away, they took them away with a Police Aircraft. When all the children came here ready to fly out to go to school, the population of Iglulik would increase drastically, it appeared to have many people. There were only a few residents here, including the staff at the Hudson’s Bay Company store and the Roman Catholic priests. Peter Irniq: You lived out on the land here, being close to the animals for survival, so when the children were soon to go out to school, did you all come here to meet in Iglulik? Louis Uttak: Yes, other people would come here. For us, we were already living here but other families would arrive here, bringing their children, so that they could go to school. They would take the children away around August. 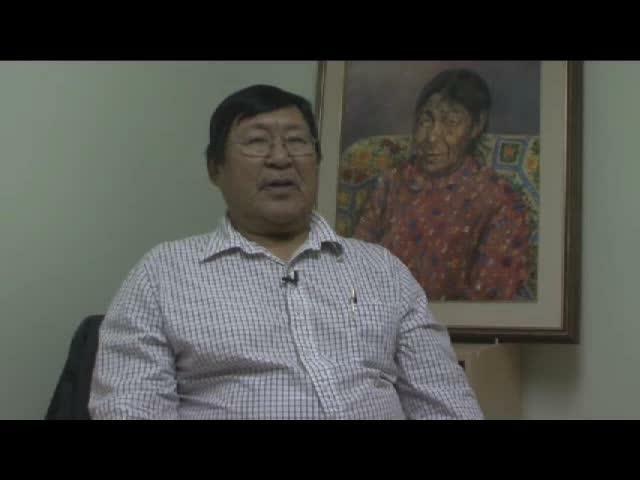 Peter Irniq: You were Inummariit(a true natured Inuit)? Louis Uttak: Yes, we were Inummariit/Inullariit(True Traditional Inuit). 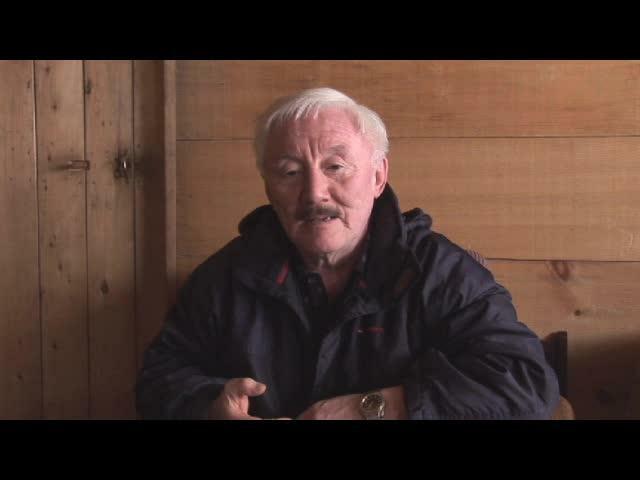 Peter Irniq: Now that you are an Elder, can you describe what Iglulik used to be like during the 1950’s and 60’s? Louis Uttak: There were four buildings. One house belong to the Roman Catholic Church. The others, staff house for the Hudson’s Bay Company, a store, and a small warehouse. These small buildings were four, all white. Peter Irniq: What about the Inuit, how did they live? Louis Uttak: They were living in tents. And then, they would live in qarmait(sod houses) in the winter time. Peter Irniq: And some in iglus? Louis Uttak: Yes, in snow houses. Peter Irniq: While the children were going to school, was your life here a hunting society, hunting caribou, moving inland in search of caribou, fishing, walrus hunting, basically, you were living very traditional, like the Inuit should? Louis Uttak: At that time, there was no caribou around, so people did not go on the land or inland to caribou hunt, but they did go out seal hunting and walrus hunting. That was the main occupation at that time. 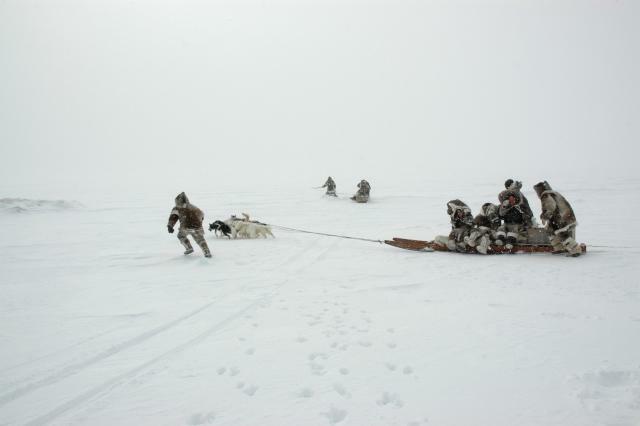 Sometimes, we went far away to hunt caribou on Baffin Island. This area here, nearby had no caribou. Peter Irniq: So when the children were being taken away to school at that time, you knew why, they were being taken away to go to school? Louis Uttak: We were informed by the Roman Catholic priests, that these children had to go to school, and learn to speak English, so that they could have good jobs in the future, so they had to go to school. 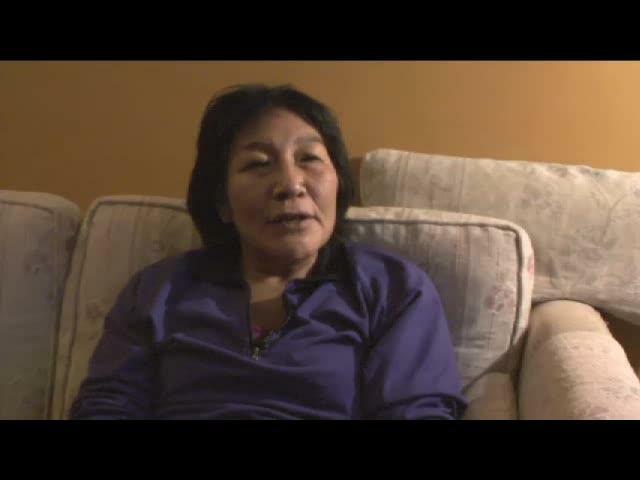 As we were very traditional Inuit, we just didn’t know anything about those things, so when they told us, it was going to be good for their future, so we just said yes to their instructions, that they will have good homes when they got to Chesterfield Inlet, and will be well-cared for by the Grey Nuns. 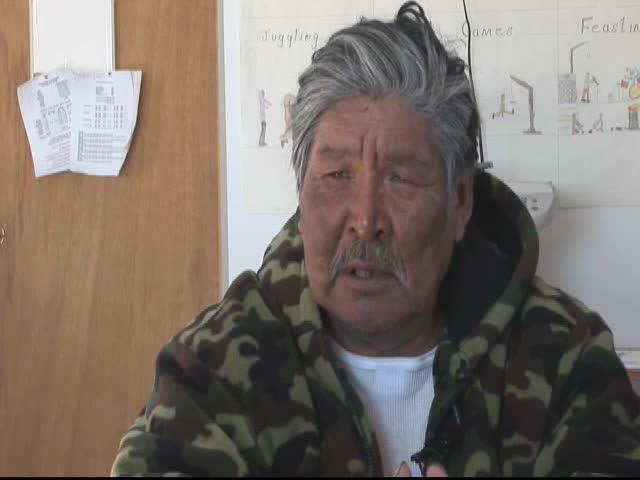 Peter Irniq: As parents or as a relative, I believe you have a younger brother, who went to school there, so were they, your brother or brothers, taught very in Inuit culture, prior to going to Chesterfield Inlet? Louis Uttak: My younger brother, the older one, I was beginning to take him out hunting on the land. He was able to help me while out there, as my father was quite a little old man. When I was beginning to take him out on the land, then he was taken away to go to school. It was during the later stages that his younger brother, Lazarie, was sent to school. They did not go out to school at the same time. Peter Irniq: How old were you at that time? Louis Uttak: I was around 17 years old and was married at the age of 17 years. Peter Irniq: Around 20 years? Peter Irniq: As a relative, an older brother, when you knew that the children were going to be sent away to school, you were obviously notified by the priests, and as a relative, and knowing the fact that your family member is your partner for life, when they were being sent away, it must have been very difficult? Louis Uttak: Yes, a lot! I was planning to be out hunting with my younger brother, as food was the only thing that we wanted to get for survival. I am sorry, you sometimes go back to that date of their departure, instantly. Peter Irniq: When they were at school over there, you would not see them for entire year? Louis Uttak: Yes. We would not see them. We would not seem them at all. But, at Christmas time, we would be informed by the Roman Catholic Church that they were celebrating Christmas and all were fine, that they were having a Happy New Year. For us, Happy New Year, did not mean anything, as we did not know anything about it or it’s meaning, as traditional people. However, we knew what Merry Christmas was. When they celebrated Happy New Year, to us, that had no meaning. Peter Irniq: Did you write to them, did you receive letters from them? Louis Uttak: Not at all. We did not write. There was no way of sending them out. Peter Irniq: Airplanes, did not come around much at that time. Louis Uttak: Yes. One-engine airplanes did come in, you know, Bush Pilots such as Charlie and Gunnar. Peter Irniq: Roman Catholic priests had already come at that time, they had what we call today, “over and out” telephones, so this is how, you got some information about the children, that they were all right and that they were enjoying school? They used to talk to their fellow-priests in the other communities? Louis Uttak: Yes. We used to hear that they were all right and that we should not worry about them. Peter Irniq: They would be out for about nine months and then return here, when they came back, was that a wonderful time? Louis Uttak: Yes, very much! They used to bring back white bags, that resembled white bags, used for flour, the little boys used to come back with pair of pants, that looked foreign with leather patches on their knees, and the little girls had cute little hats. We saw that like that. They looked like beautiful White People. Peter Irniq: That is what they were being sent out to become White People, assimilated? Peter Irniq: When they arrive, they would become, young girls still, and the young boys the same thing, when they arrived and you came here to Iglulik to get them from the plane, so when they came home, did you take them back out on the land, to places where there were fish or seals? Louis Uttak: There was no other way but! But, they would also become more lazy and clumsy, I especially noticed that with my two brothers. I used to think that, they would know more about living on the land, had they not gone to that residential school. Guranteed, what we had to do was to follow the instructions of the Government and Church at that time. Peter Irniq: If you did not wanted to send them out to school, do you know what would have happened to you as parents, were you aware? Louis Uttak: I remember my father saying, “here is my big helper, he is gone.” That was what he said. Here were two of my younger brothers, who were old enough to be his helpers, they are gone, he used to say how sorry he was about the fact that they were gone, he used to say that more than once. Peter Irniq: Were you ever told as parents that if you did not send your kids to school, you could be put in jail by the police or your family allowance of $6 a month, could be cut off? Have you ever heard that statement said to parents? Louis Uttak: I actually did not hear about the fact that you could be taken by the police but I specifically remember that you would not receive your family allowance. I remember very well, when the parents were told about the fact that if they did not send their children to go to school, they would not be provided with family alowances, that was what I heard in those days. Peter Irniq: You mentioned that when the students would return home, they would become a bit clumsy, no wonder, do you also believe that, they would forget much of their Inuit culture and their language, when they would return home? Louis Uttak: Yes, of course, no wonder! No wonder! And the other thing was while they were speaking in Inuktitut, they would speak some English, mixed with it. We would not understand. So, they would speak some English, while speaking Inuktitut. Each year, next year, especially my two brothers, it was like, they would become more and more strangers. And more foreign! They were becoming more and more foreign, as they grew older. Peter Irniq: When you look at the survivors of Residential School, do you believe that we have lost a lot more parenting skills, than you guys did? We don’t hold as good of a parenting skill, as you did? Louis Uttak: Yes, very much. Peter Irniq: After they had gone to that residential school, their lives would change very much, very foreign, that was how they would return home. If we had not been to a residential school, we would not have lost so much. If we would not have gone to that residential school, do you believe that, we would hold so much more Inuit culture and Inuit language? Do you believe this also? Louis Uttak: Absolutely! It’s not a wonder, they were like that. Absolutely. It was exactly like that! The ones who did not go to school, were much knowledgeable about hunting and surviving in the winter time. They were able to make good iglus in the winter time. They knew how to prepare food very good. And, they were much more healthly, it was noticeable. That was noticeable. Peter Irniq: Please, don’t be sorry, it’s okay…..
Peter Irniq: I forgot what I was going to ask…..Yes, when we had been attending school in Chesterfield Inlet, learning to speak English, learning to write in English and adding arithmetic, looking at it today, do you think, those of us that went to school in Chesterfield Inlet, does it look like, we are well educated? 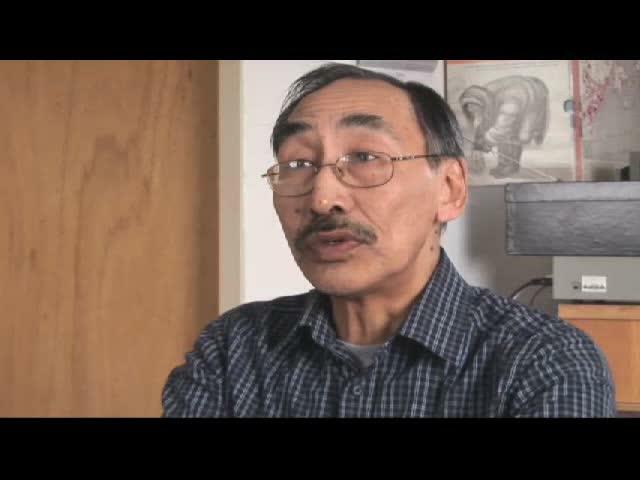 Louis Uttak: No, but what you all were going to learn and become knowledgeable about Inuit culture and our strength, it’s like, that part has been taken off. It’s taken off! Peter Irniq: What about having been educated in English, what does it look like? Louis Uttak: In some, it is very good, some of you have become leaders. Only some. Quite a few, for example, Kusugaq(Jose), you, people like, Louis Tapaarjuk, with this it’s very good, when you are working towards improving the Government. But others, they didn’t seem to go all the way, like they started to use alcohol, although, I don’t want to remind myself of this. But, you are all not the same. You have many uses. 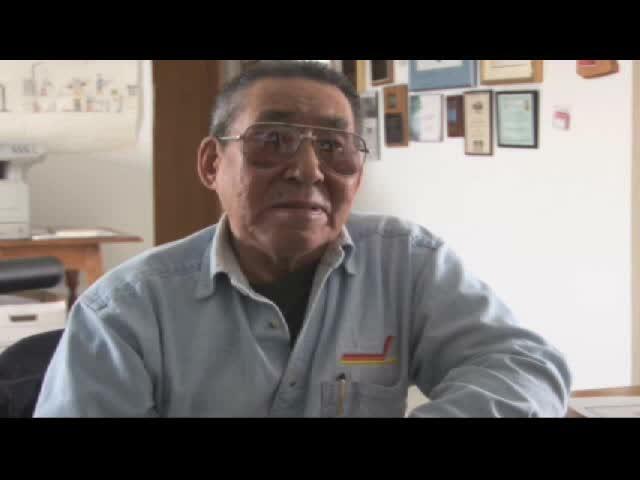 Many have become leaders, who have gone to school in Chesterfield Inlet. 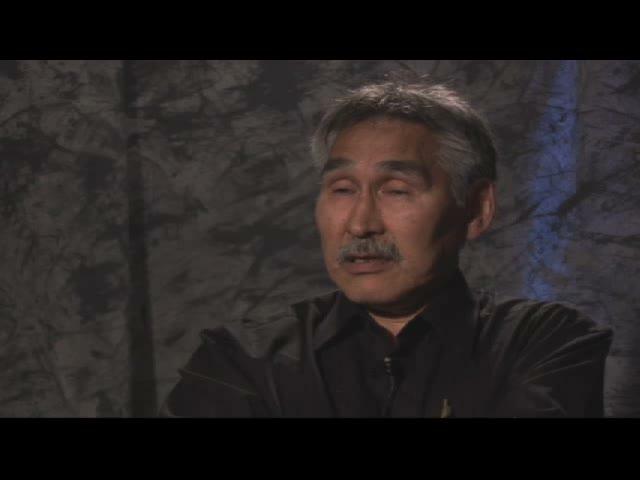 Peter Irniq: But, we paid a very high price, we lost out a lot with our Inuit culture. Louis Uttak: Yes! Absolutely! Yes, Absolutely! For sure! Peter Irniq: We have also lost a lot of our language? Peter Irniq: We have also lost some of the legends of myths? Including Traditional Inuit songs. Especially those that made us Inuit in those days, and the foundations of the Inuit, at that time. And since time immemorial. Peter Irniq: What else do you have to say? Louis Uttak: Yes, of course. I want to say something, perhaps it won’t be appropriate? Louis Uttak: My son, he went away when he was six years old. When he was very small. When he left, although my wife and I loved him very much, my wife named him after her grandmother, so we loved him very much. When he was at that very young age, he was apparently sexually abused. He started to think that this was part of his culture, so to this day, he is like that. This is extremely painful for us. Otherwise, he would have been our help. His mind is now broken. To my wife and myself, this is the most stressful! He was our first child. As a result, he has become a sexual assaulter himself. He is currently at Ikajurtauvvik(correctional institution). This is very hard on us, sometimes it is very painful. Sometimes, without being seen, in some mornings, we sometimes discuss this. It’s like some of your body is taken off and is missing. Part of it is missing somewhere but it cannot be helped. Peter Irniq: If he had been with you among his own fellow-Inuit, it’s obvious, he would not have been abused like that? Louis Uttak: Yes, for sure! Peter Irniq: This is absolutely not our culture, to the little children? Louis Uttak: Absolutely. Of course! We knew who taught him this, I know the person, I just don’t want to say the person’s name. Peter Irniq: It’s good that you mention this, it will help others, no matter where they are. Peter Irniq: Since he was abused like that and it happened to little children, it is being talked about quite a lot all over the place today, those of us who went to school, we talk about it, if you were to see the people, who used to do these things, what would you say to them today? Louis Uttak: Now that person has died since, I cannot tell him anything any more. If I say his name, is it okay? Louis Uttak: He was a Brother, his used to be known as “Igajialuk” “A big cook”, he was a cook for the priests. He was the one who abused my little one. So, he learned from him and as as a result, he thought, this was part of life. It is extremely resentful and hurtful! Sometimes, as I said, my wife and I are sometimes unhappy about that situation. 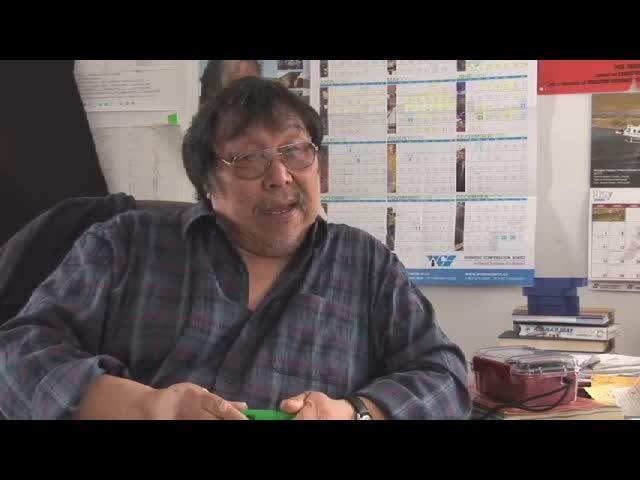 Peter Irniq: We had a reunion in Chesterfield Inlet in 1993, particularly regarding those, who were sexually abused, talking about these things by the residential school survivors, by parents and the public, keeping in mind that we have a zero-tolerence for sexual assaults, and making sure that these things are never repeated in the future, do you think, the meeting we had was very useful? Louis Uttak: Yes, it was very helpful. It was very helpful and aimed towards healing. If it could be done again, even though, it might be slow, it would be very helpful again. It would be very helpful inside Nunavut, for those who went to school in Chesterfield Inlet. Yes, absolutely. Peter Irniq: If we were to have another reunion of residential school survivors in Chesterfield Inlet, or somewhere else, to talk about positive things this time around and if possible, bring the parents of, would this be a right way of doing it as well? Louis Uttak: Yes, of course. It would be a reunion of celebrations. People would be happy. Yes, very much. The money is always the problem but…the stuff that you are talking about would be very good for our future, as long as I am still alive…but then again, it’s hard to know ahead. 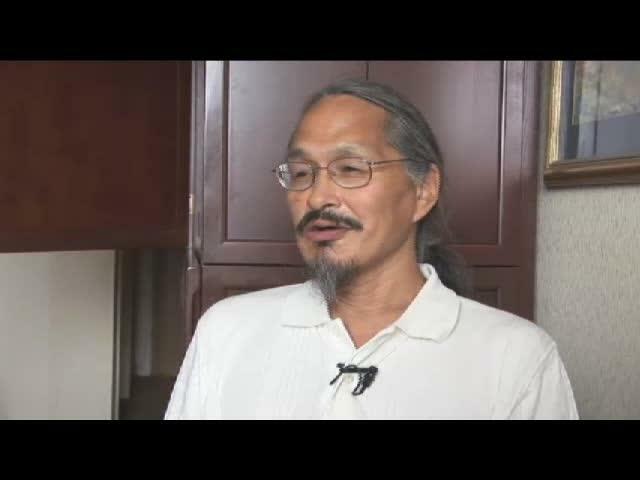 Peter Irniq: When we talk about healing, this whole exercise has become a lifetime healing, from that experience for those of us that went to school there, if we have those people who are taking a healing journey from those experiences, if they would have an opportunity to do more healing, do you think, this would be very helpful for our fellow-Inuit in the future? Louis Uttak: Yes, of course, it would be. I forgot what I was going to say, darn it! Those are have been hurt, some of them no longer believe in some priests. Even though, they belong to Catholicism, they no longer practice it, because they are still extremely hurt and in pain. Some of them no longer care about them, while some still do believe. Peter Irniq: Yes, I understand you very well. And what you want to do, to help others, I understand it very well and appreciate it very much. You can still say what you want to say, if you want. If you don’t want to say something about what you do not want to make public, you are free to do whatever you want. Louis Uttak: Perhaps, I could say a bit more. Towards Nunaliurti(Creator), to God, some have not changed their attitudes. Some have move on from the Roman Catholic Church, as they were made to be very hurt and in pain. Those survivors who are still make the sign of the cross, are now divided, since attending school in Chesterfield Inlet. We as adults, will not intervene, as they are free to do whatever they want to do. Peter Irniq: When they were in Chesterfield Inlet, perhaps some of them are feeling, they are prayed out or perhaps not, but maybe this is contributing to the fact that they no longer wish to be part of Roman Catholic Church? Louis Uttak: Yes. They prayed too much and too often, every evening, every meal, they were made to go to church too much, every day, they were made to pray too much and overboard, some of them got tired of it, since their childhood. Now, this had this feeling, as they were growing up as adults. 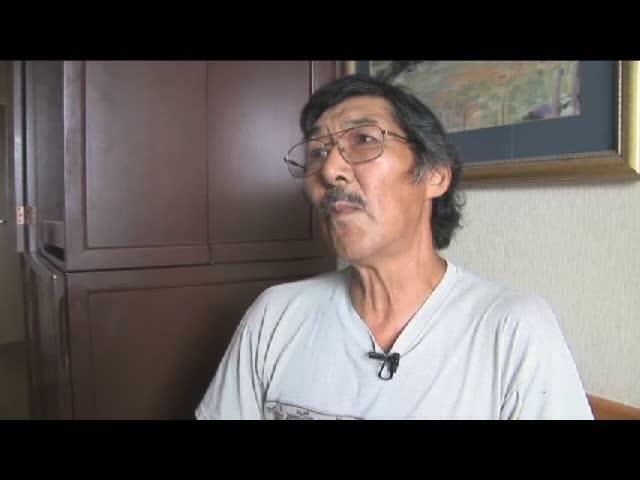 Peter Irniq: At that time in February 26, 1996, here in Iglulik, the Bishop of the Roman Catholic Church, and regarding those who were sexually abused in Chesterfield Inlet while we were going to school, he came to deliver an Apology. We were present, including Jack Anawak, Marius Tungilik, Andre Tautu, we came here to support each other and also to support our fellow-Inuit in Iglulik, who we went to school with, I think, you were there to listen. His apology at that time, did it help to make things easier for the future? Louis Uttak: I myself thought, it was too weak. For me, personally. I thought, he did go far enough to comfort and please everyone. That was my own feeling. Peter Irniq: If the Prime Minister of Canada, could apologise to all Aboriginal People, not only to us as Inuit, but to First Nations and Metis, if the PM could make an apology to us, and be heard by all Canadians, and other international community, would this be the right thing to do for us? Louis Uttak: Yes, absolutely, there is no other way! It would be good for Nunavutmiut and Indians, as they were also heavily abused. It would be good for Nunavut as well to those Inuvialuit in the western Arctic. If he could make that apology and if could hear what he is saying about the apology through CBC for us Inuit who are unilingual, we would breathe a lot easier, many of us. While we are all still alive..
Peter Irniq: What did you think of that compensation money we got for those of us, who went to that residential school in Chesterfield Inlet? What did you think of it? Louis Uttak: What I thought about that compensation money was about the fact that, as long as they use it wisely. If they were going to get a useable thing for it, it would have made me happy. If they were going to use it for things that were going to break their lives with, it would be very resentful. I had two of those as my thoughts. Peter Irniq: If they only played gambling with it with cards.? Louis Uttak: Yes. Even just using alcohol with it. Peter Irniq: There was lot of money? Peter Irniq: As an Inuk, it was a lot of money. 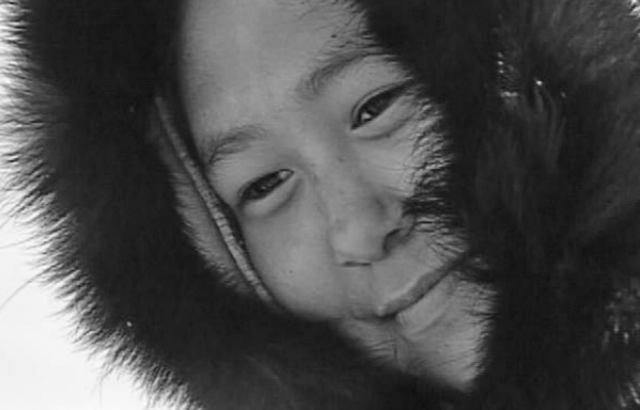 Peter Irniq: I don’t really have any more questions but, when we were leaving our homes in those days, our mothers made us really beautiful clothing, they made beautiful coats and beautiful kamiik(seal skin boots), all those things, when the children were leaving, you went to see them off, can you talk about what it was like? Louis Uttak: Yes, of course. They used to come and get them with airplanes, that landed on the water, they had floats. That was with a large Canso aircraft. When they were being taken away, I used to bring them with small skiff, that I had to row it. The little children used to be different. Those who had more, used to have beautiful clean kamiik(seal skin boots), ones who were less fortunate like us, they used to leave, little bit dirty, even though, they were not that dirty, in that sense, they were all different. I still remember them well, their mothers, their parents, were looking towards us, while I was rowing the boat to the plane. Some were in pain! Some were crying. I used to see the parents like that, they were so hurt. Here I was bringing little ones, that were well dressed, ready to go. Peter Irniq: At that time, when we were leaving, for example, my mother made me beautiful niururiak(seal skin boots with hair on them), I used the brand new niururiak that she had made, I did not know personally that I was leaving but I was forcibly taken by the Roman Catholic priest, and I had put on my Inuit parka. No wonder, we were very traditional Inuit. When the children came home, did they wear the clothing that they had left with earlier? Louis Uttak: No! As I said when we started this conversation, you had leather on the knees of your pants, the little girls had, little hats, that was what they returned home with. Peter Irniq: What about the clothing they left with? Louis Uttak: I don’t know, I don’t remember this. When they left home, they left with beautifully made kamiik(seal skin boots), whether they return home with them or not, I don’t remember at all. Peter Irniq: What about the language? When your own children left using the traditional language from here. When they returned home, did they continued to use the traditional language, they left with? Louis Uttak: No. 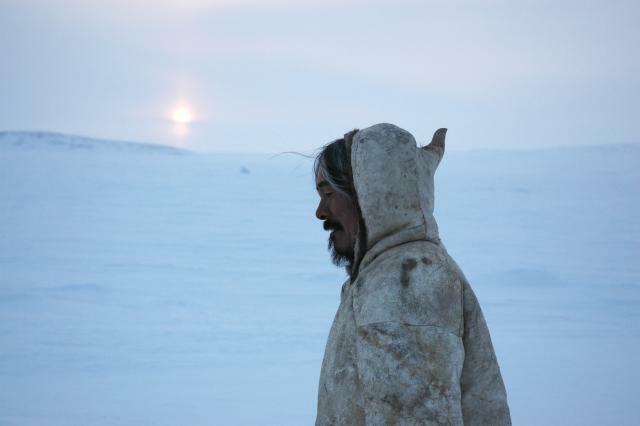 When they returned home, they spoke the dialect of Inuit from Chesterfield Inlet. 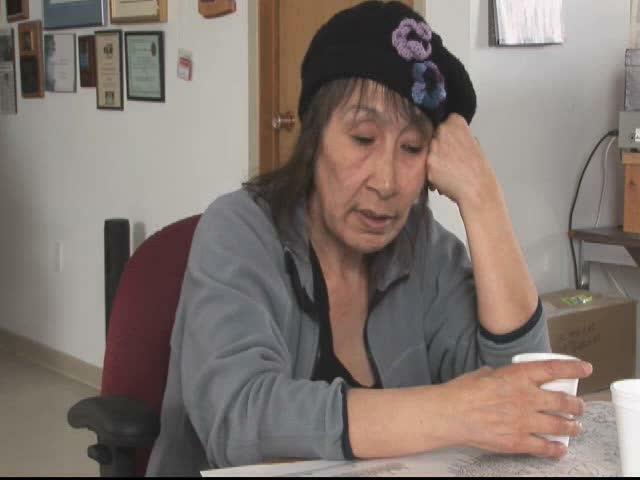 They used words like, “asu” “don’t”, for example, and they longer spoke Iglulik or Amitturmiut dialects. That was how, they would return home. Only few, were noticeable. Peter Irniq: When we went to school there, we were told not to speak our Inuktitut language. That was what we were told. If we were caught speaking Inuktitut, we would be hit with a yardstick, on the palm of our hands. That in itself was extremely painful. The thing is, many of us still speak much of our language. And we are ones that are saying to the society today that let’s learn more about Inuit culture and let’s work to make sure that our language is not forgotten. Is this something that is useful? Louis Uttak: Of course! There is no other way. It is truly wonderful that you are talking about this. The language of the Inuit is the strongest, our strength. Also, let us not forget the writing system. That is something that should be taught for our future, if we could do it today in a faster way. Peter Irniq: Today, we teach our little kids in Kindergarten in Inuktitut. They are taught in our Inuit language up to Grade 3. This is the law in Nunavut. If you would see law that would allow us to be taught in our language up to Grade 12, if you yourself is a big boss, if you are a Minister of Education, let’s teach them in their own language all the way up to Grade 12. Would you take that action? Louis Uttak: Of course. Inuit are very able. They are very able about Inuit culture and our language. As well about the writing system of syllabics. Those are the two issues that I truly feel strongly about. I will move on with them for as long as I am able. Peter Irniq: They are the right thing to do? Louis Uttak: Yes, they are the right thing to do. Absolutely! Peter Irniq: Elders are being used again today. When we were going to school, their status as Elders, was no longer use as much. They are being used again today. Are you happy about this? Louis Uttak: Yes, very much, I am very happy about this. At that time, I would not have been noticed as an Elder. The Elders are being included today, this is something I am extremely happy about. Peter Irniq: Today if the Elders, both men and women are allowed to be in the classroom on a more permanent basis, teaching about Inuit culture and language, would this be the right thing to do? Louis Uttak: Yes, I use myself as an example, as my wife and I teach. When we go out seal hunting in the spring time, they at first are hesitant about learning but when they get going, they get to become very attach to what they are learning. They also learn about their own language, when they get away from the community and go out on the land. This is really wonderful. Living in a community here, we don’t get to pay attention to each other. There are too many things going on, such TV, and all sorts. Peter Irniq: Today, Inuit culture has been detoured big time. Just as an example, building Inuksuit(plural). Today we see for example, inunnguat(imitations of people), being called Inuksuit, with heads, legs and arms, they are all over the place now. There are lots of them now in southern Canada. And they call them Inuksuk. What do you think of all this? 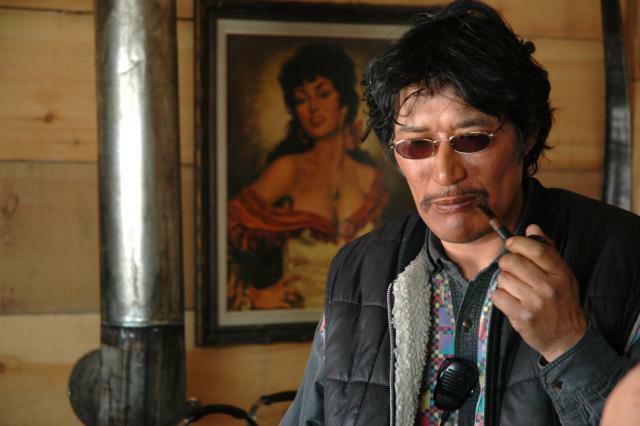 Louis Uttak: I don’t like the Inunnguat, very much! There was a little old man, who committed suicide, he was an old man, up there, there is Iglulik’s big Inunnguaq(imitation of person), it is well-liked by White People, that old man did not like it at all, as it is a sign/indication for murder, or one who commits suicide. That was what he used to say. Peter Irniq: Inuksuk, made by Inuit, sometimes have “pointers”, what is a real interpretation of an Inuksuk? Louis Uttak: To me that Inuksuk, if it represents fishing, or if it is made along the sea coast, that there are seals here, and if it is build in areas where there are lakes on the land, it means, there are caribou. They are very easily to know. They are very good indicators of places for fishing and caribou hunting. Those that have their “arms, wide open”, we Elders don’t like that what-so-ever! Peter Irniq: They don’t represent Inuit culture, for obvious reasons? Peter Irniq: What do you understand about drum dancing? Louis Uttak: Regarding the drum dancing, we the Inuit of Qikiqtani(Baffin Island), we were told stop using drum dancing, the singing of traditional by the Anglican missionaries. That was how we lost it all. All around Baffin Island, we were told that we no longer had to practice our culture including drum dancing, singing of traditional songs, story telling of myths/legends, we were told to cut them all off! That missionary was one person, who totally cut off that part of the culture. 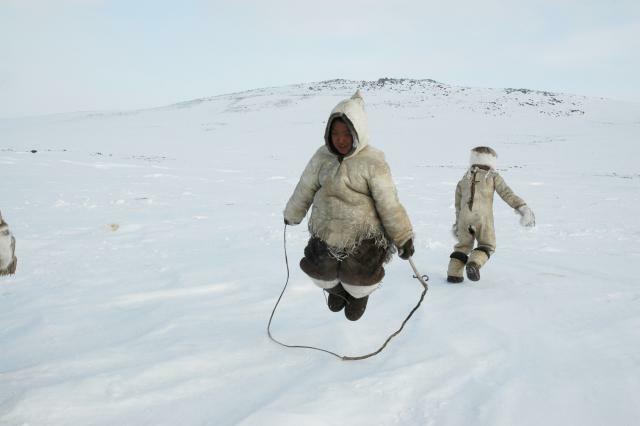 But, the Inuit here, know and remember about the meaning of it, this is wonderful. The late Noah Piugaattuq and my father used to say, this drum dancing is a celebration. It is a celebration of thankfulness. It was the celebration of singing and story telling, by being purely happy. That was what Noah Piugaattuq and my father used to say. Perhaps, I don’t answer you appropriately. Peter Irniq: You answer appropriately. I like your answers. Peter Irniq: When we were in Chesterfield Inlet to go to school. As for me, I was there for four years. When I was 11 years old, I was taken away by a priest. While I was in Chesterfield Inlet for all the years that I was there. The school opened in 1953 and closed in 1969, as soon as the Northwest Territories Government took over. It is wonderful that they closed it down. For all the time that I was there, I did not seen one drum dance, whats-so-ever. When the Government of the Northwest Territories came to be, we decided to take back the business of drum dancing. I remember when drum dances used to be held. Using your own words, drum dancing was a celebration of life, in all of Nunavut. Louis Uttak: Of course, there is no other way about it. Peter Irniq: Today, we are drum dancing again in all of Nunavut, this really is wonderful, eh? Louis Uttak: Of course, yes. It was always a celebration and thankfulness. That is what I am aware regarding this. Peter Irniq: But, we have to teach the traditional Inuit singers about it. Louis Uttak: Yes. Absolutely. We have to teach them how to sing. Peter Irniq: About these pisiit(Traditional Inuit Songs), what do you think of them? Louis Uttak: These talk about the difficult times they have faced. They tell a story about how close they were in contact with danger. They talk about the animals. In composing Inuit songs, they never call the animals by their proper names. For example, caribou is “one with horns” walrus is “one with thick skin hide”, a composer would never call the animals by their names. He will not say, “caribou” “aiviq” – Walrus), he would be talking about huner, he would be talking about surviving, and he would be talking about them in a wonderful way. They are pleasant to listen to, as he talks about his songs. Peter Irniq: Why is it that when Inuit are composing their songs, they don’t’ call the animals by their proper names? Why don’t they say, tuktu – caribou? Why? Why don’t they say, Nattiq(seal)? Louis Uttak: I don’t totally understand this but they talk about seals for example as spotties, especially for the common ring seals. Perhaps, they don’t want to be seen as conceded as hunters. When the drum dancers were drum dancing, and while the wife was singing the traditional song, they used to watch them or observe them carefully. Just by listening to the song, sung by his wife, the people would pay particular attention of what type of aniamals, the man has caught. This is a common knowledge. 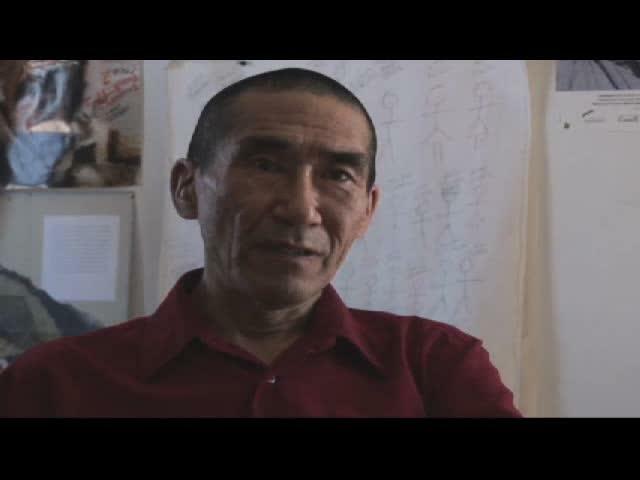 Peter Irniq: Do you also believe that, prior to the coming of the Roman Catholic or Anglican Missionaries, we never had a writing system as Inuit, the composing of Inuit traditional songs are like our only way of writing our thoughts, tell our histories. What is what one thinks about them? Louis Uttak: Yes, absolutely! Through the brain here, they will not lose the traditional songs. It was like through their brains, they would never lose the traditional songs. The songs and traditional stories were kept, not in the computers but in their own brains. Wow! Inuit are very, very wise! Peter Irniq: If Inuit songs are translated into English, what would you think of it? Louis Uttak: I would like it very much, if they are translated into English. If they interpret what they mean, I would like it very much if they translate them into English. People recognize the strength of the Inuit. Qablunaat would become more knowledgeable. Qablunaat play guitars, Inuit are exactly the same way, about their songs. 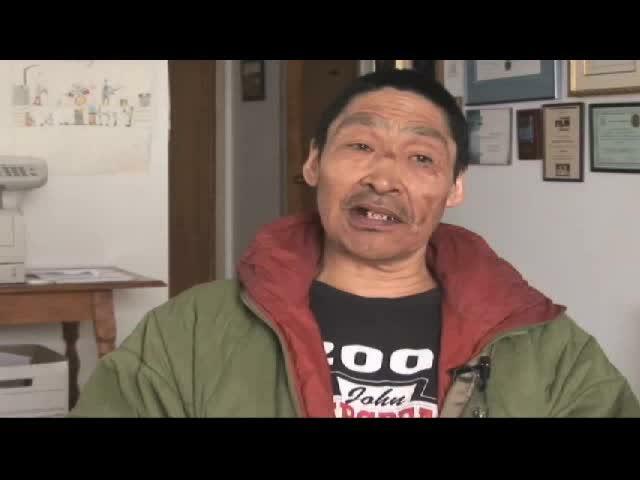 Peter Irniq: When we were in Chesterfield Inlet, we were sexually abused. When the children came home from there, did they complain to you as parents that they used to be sexually abused? Louis Uttak: No. No way! They would never complain. They were told, never to tell anyone. Even though, they did not complain, you know, they have become, big boys, we would ask them to say something even though, we would not ask them ourselves. It was obvious that they were in pain about it. They were hiding something. I knew about this my son. It was noticeable about the fact that, he would never let out, about what he was hurting. It was obvious. I wasn’t going to ask him about. It was obvious that his mind was far away and disturbed. I knew about that. Both my wife and I knew this. They would under no circumstances, complain! Peter Irniq: At that time, when Jack Anawak and I started to talk about this publically(in 1990), were many people surprised and started? Louis Uttak: It was very hurtful! It was very hurtful for me, as I would listen to the radio about it. It was good too that it was being brought out in public, but it was painful. You felt it very strongly! Go! Go! Go! Go for it, that was what we said. My wife and I said, go, make it public. But, I don’t know about the others. Go ahead, make it public, that was what we thought. Peter Irniq: Today, we are still talking about it, in some ways. Today, I am wondering, if it has been helpful to many Inuit. Today, is it something that the society would want us to go ahead with it to continue to pursue it? Louis Uttak: Yes, it is something that is being supported now. If you are getting lots of support, it is very, very good. 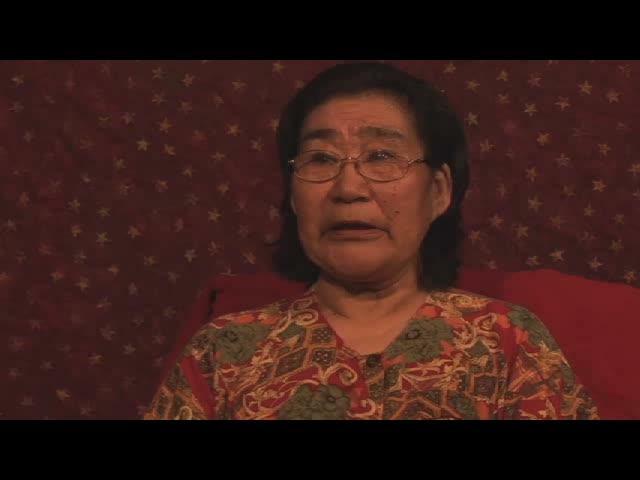 It is very good and give you more strength, as some Inuit who are parents of survivors are still living. Their children, who went to school there, are still alive. It is good to pursue, it’s wonderful. It is wonderful, that the experience is still being made public. Peter Irniq: Thank you very much! Louis Uttak: You too. Thank you for your very good questions.